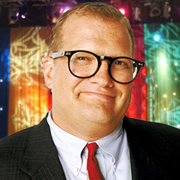 As you’ve no doubt heard by now, Drew Carey has won the coveted position as host of CBS’ The Price is Right. Previous host Bob Barker stepped down in June after 35 years on the job and many are curious to see how long Carey will stay at the post. It’s interesting that, after several months of auditions by seemingly more natural choices like George Hamilton, John O’Hurley Mark Steines and Dave Price, CBS chose to go with Carey. Unlike the others, Carey didn’t tape a sample Price is Right episode and has never set foot on the Price set. The network became interested in Carey after they saw the pilot for his new CBS primetime game show Power of Ten (Power debuts on August 7th and Carey will continue as host). CBS Entertainment president Nina Tassler credited network chief Leslie Moonves, who worked with Carey at Warner Bros. during the days of The Drew Carey Show, as coming up with the idea. One thing is for sure, Carey’s style is quite different from Barker’s so the game show is likely to go through some changes. For one thing, producers are planning to take the show on the road and broadcast from different cities in the U.S. for a week or two at a time. Will the new Price is Right be able to hang onto its existing audience? Will the ratings grow or shrink? We’ll find out soon enough as Carey’s debut will air sometime this fall. Stay tuned! I dont agree with you about people wont watch with Drew Carey as the host, I would not have picked him myself but it is a great morning show so people are still going to watch it. Too bad Wayne Brady is doing Dont forget the Lyrics he would have been a good host on TPIR, But they could not have found a better host for Dont Forget The Lyrics, he is perfect for that. I cant believe that CBS pulled the show it was our new favorite show and we have been waiting for the next eposode now for what seems like forever! Very uncool!!! why would you give a show prime time slots and then jerk it away after it already has a following of fans. please put it back on for the remainder of the final series. Thanks D.R. DON’T PUT THE CAREY GUY IN BOB’S PLACE. THE PRICE IS RIGHT SHOULD AT LEAST HAVE AN UNKNOWN OR ANYONE ELSE. YOU’LL LOSE AT LEAST ONE MILLIONS VIEWERS- CAREY IS JUST NOT THE ONE TO HAVE ON YOUR SHOW. HIS LAUGHS AND JOKES ARE FOR HIMSELF ONLY. I am concerned about the off color comments/questions from the teasers for Drew Carey’s new show. I think comments/questions about underwear and virginity are not appropriate for a family show.